Where do you like sitting on an airplane? At the very front or the very back? At a window or an aisle? According to research by British Airways, the most popular seats on a Boeing 747 are 51B/51C, 52B/52C, 51H/51J and 52 H/52J. That's all the way in the back of the plane. Those seats are the most commonly chosen by travelers because on a 747, they're the only seats that come in a pair (as opposed to three seats in a row). Couples travelling together would lock those seats up first in economy class because they wouldn't have to share their row with anybody. Makes sense. What's interesting is that in First Class, it's the exact opposite. 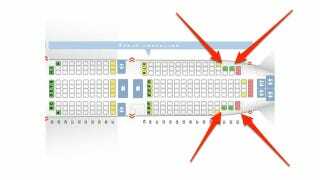 The most popular seats are at the very front (1A and 1K, both window seats) of the plane. I guess you want to be the first of the First in First Class?